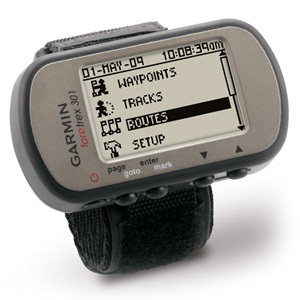 Foretrex 301 is a slim wrist-mounted GPS navigator perfect for outdoor activities that require the use of both hands. 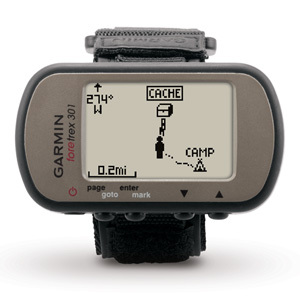 It combines a high-sensitivity GPS receiver, rugged, water resistant design, and USB interface into a lightweight device ideal for hikers, skiers and campers. You'll never worry about getting lost with Foretrex 301. It keeps track of your path and displays it as a dotted trail on the screen. Turn on the TracBack® feature and you can retrace your path back to where you started. You can save locations in memory as waypoints (up to 500 of them), so you can always find your way back to any important place, such as your campsite or vehicle. 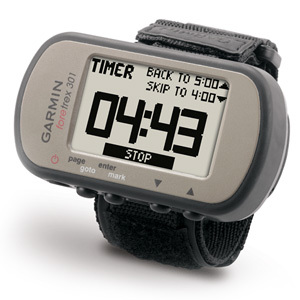 And it boasts up to 18 hours of battery life and replaceable AAA batteries.